Educate yourself about the lives that rabbits who live on meat farms suffer. 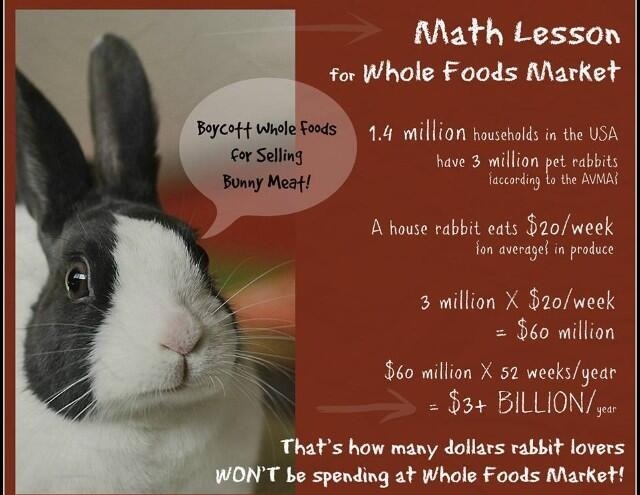 This is how Whole Foods’ rabbits are raised; and this is how they are killed. Tell Whole Foods to stop selling rabbits. Visit these stores’ Facebook pages to share your thoughts on Whole Foods’ decision. Tell Whole Foods managers, staffers, and customers, what great animals rabbits are, and in particular, emphasize New Zealand rabbits, the rabbits being raised and killed for meat. Tell others to get onboard, via Facebook, Twitter, or even Pinterest. If you feel moved to do so, stop shopping at Whole Foods and take your business elsewhere until they stop selling rabbit meat. 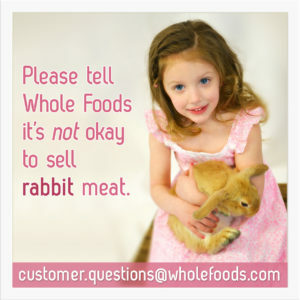 Whole Foods is now selling rabbit meat in most of the country (Northern California, North Atlantic, Mid-Atlantic, Northeast, Florida, South, Pacific Northwest, Midwest, and the Washington, DC metro area). They are now auto-shipping rabbit meat to almost every store in the country, whether or not the store managers want the meat or not.